Tigard, OR – January 16, 2018 – (GuitarPR) – StrapGraphics Company, the Oregon-based producer of high-quality custom guitar straps has announced the launch of a new web platform to streamline their ordering and delivery process. Their new website, which is now mobile-friendly, allows customers to create their own unique designs or quickly purchase products from an existing catalog of straps with ease. StrapGraphics offers guitar straps in a variety of both hand-crafted leather and polyester styles. For those who want to design their own, there’s a special web-based design tool that lets customers create and upload their images with precision. According to founder, Nate DeHart, “We use a digital process that allows us to print full color pictures on our straps. Our leather guitar straps go through a proprietary process we’ve created, which means they’re like no other guitar strap out there. We use a sublimation process for our polyester guitar straps, which means, you can sweat on them, wash them or spill beer on them without ruining the print. For the strap designer, templates are available for use with tools like Photoshop and Illustrator. After placing a custom order online, it takes StrapGraphics about two weeks to make the strap(s) and prep them for delivery. Several shipping options are available and selectable during the checkout process. In addition, StrapGraphics offers a Wholesale Services program that can be used for promotional activities. 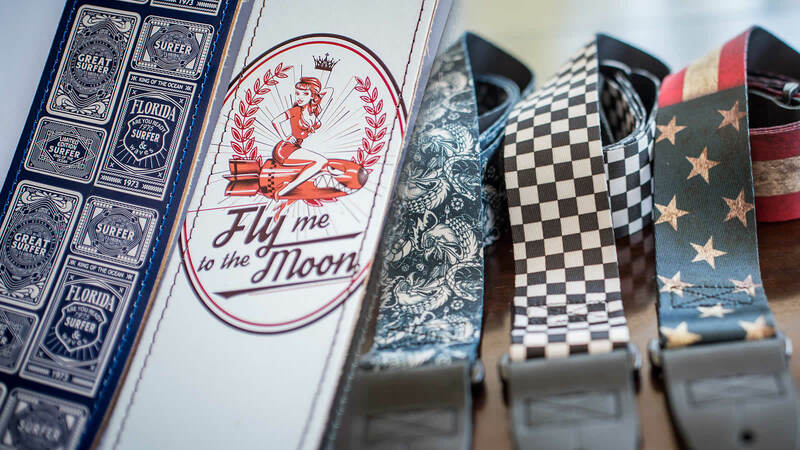 Organizations, bands, and companies can create their own straps for giveaways or resale opportunities. For more information on creating custom guitar straps, visit StrapGraphics.com. Click image above to download hi-resolution version.